Ashley Young was one of the last traditional English wingers. Much like Theo Walcott and Aaron Lennon, Young boasted an abundance of pace and loved to run fearlessly at opposition defences. Back in the mid noughties, when he broke through at Watford, managers were still clinging to formations that relied on fast wide players to whip crosses into a target-man. While inverted wingers and overlapping full-backs gradually became the prevailing mode of providing width, Young was once in his element. The first game of the new Premier League season is history, and Manchester United fans everywhere are excited at the thought of Bastian Schweinsteiger roaring through the midfield, while Pedro reprises his attacking role from the Pep Guardiola years at Barcelona, running off the Lionel Messi incarnation-in-red that is Wayne Rooney. As expected in a first game of a new campaign United’s performance was somewhat laboured and tepid. Supporters and commentators failed to mention that the conditions at Old Trafford were more akin to the Seychelles than Stretford, leading to a tiresome affair where neither team had the energy or fitness to excel. However, United bagged the points – and that is all that matters – but the debate as to where certain individuals should play has reignited. Rooney occupied the striker’s role, with Memphis Depay at number 10, and both were serviced by two wide players who are certainly not flying Red Devils-style wingers. 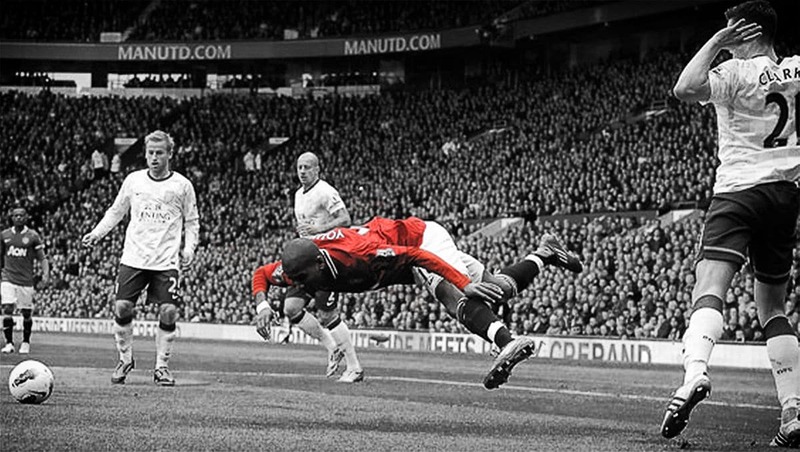 The inclusion of Ashley Young continues to be divisive among Reds. The former Aston Villa player has had an epic journey since the start of Louis van Gaal’s tenure, finding his way from outcast to on-the-pitch lieutenant in the space of 12 months. There is little doubt the future for Young is a limited one; he will never be a world-class entity in his own right. However, he has earned Van Gaal’s trust by doing one simple thing: doing as he is told. This may sound like the least aspirational element in terms of a footballer’s contribution to a team, but it is arguably the most important. Van Gaal entered United during a time of turmoil and meltdown, as the ashes of David Moyes’ failed experiment burned like the stench from a farmer’s field. Out went fan favourites like Danny Welbeck, who—despite running his socks off on a weekly basis—was not the new manager’s “cup of tea,” when he had Radamel Falcao in his back pocket. But unlike Welbeck, Young survived the restructuring process in Van Gaal’s opening gambit, by doing what it takes to survive. There is a common myth that Young is a bad player. This is a tag shared by Michael Carrick and Jonny Evans. The latter, of course, has done himself absolutely no favours over the past year. Young enjoyed a very credible 1:5 goal ratio during his 250 games at Watford and Villa, winning the PFA Young Player of the Year in 2008-09, and appearing in the PFA’s Team of the Year on two occasions. Add to this Young’s three Premier League Player of the Month awards, and you have the DNA of a very good footballer. However, it is true to say Young has underwhelmed in a United shirt. Young’s goal ratio has drifted out to 1:9, and he is not the attacking force he once was. For many fans, Young is more famous for falling over in the penalty area than skill and wonderment, and this is undoubtedly his own fault. But where Nani and Shinji Kagawa focused on using their flair, Young made himself indispensable to Van Gaal when the ship was rocking, and the Dutchman was trying to find ways to stop the vessel from sinking. United fans are waiting for the arrival of Pedro—who seems destined to roll up at Old Trafford in the next few weeks—and are desperate to see Memphis play in the position from which he dominated at PSV Eindhoven last season. But the manager will treat his new investment from the Netherlands with kid gloves, and the deployment behind Rooney is an entirely deliberate one. The new number seven does not offer the same defensive coverage as Young and, with the expectation that Luke Shaw will bomb forward at every opportunity, United need a midfielder who will cover the raiding left-back. Observing Memphis off the ball against Tottenham Hotspur, it is clear he is not tactically ready to fulfil this specific requirement, and he appeared somewhat disinterested in any defensive duties, which is crucial under Van Gaal’s philosophy. Pedro is a busy player, and certainly has the attributes and experience to press and defend in the wider positions. He will be Young’s main threat in the coming weeks. Juan Mata is a man transformed on the right flank, and despite not being a winger or possessing pace, the Spaniard’s overall work rate is markedly better than in his Chelsea days. Many would rather Young is dropped all together, with Van Gaal finding a new system that incorporates Ander Herrera, and not witness the pragmatism of the current regime. Herrera is a difficult card to play in the game as things stand. He is a wonderful talent, but a coach doesn’t spend big on Schweinsteiger and Morgan Schneiderlin if he is happy with his central midfield. So for now, United fans are going to have to put up with Young’s presence in the first XI, but they should not ignore that fact he is there on merit. Statistically, he does not provide the assists that Angel Di Maria did for United, but the manager trusts him to execute a role which lets others play.If Young busts a gut, it means Memphis doesn’t have to, and he can still drop wide left to pick up the ball and attack. If Pedro is successfully signed, Reds may get their wish for Young to quickly return to the bench, but Mata’s place in the team is arguably under more threat. Young is one of the jigsaw pieces in the full picture of Di Maria’s failure at United, blocking the Argentinian’s route back into the starting line-up last year. Despite his unpopularity with many supporters, he might just also stop Depay playing on the left. After all, Van Gaal’s formation against Spurs – 4-2-3-1 – is closer to Sir Alex Ferguson’s version of 4-4-1-1 than it is to the Dutchman’s preferred 4-3-3. But it is likely the latter formation will be fully taken up once the manager feels he has the correct personnel to execute it. Young deserves credit for his application over the past year, in the same way Marouane Fellaini also does. But while the heart of United beats through the chest of Van Gaal, there will always be a place for a player such as Ashley Young. He has rightfully been freed from the chains of public opinion, and a great season could rewrite how the history books look back at his career. 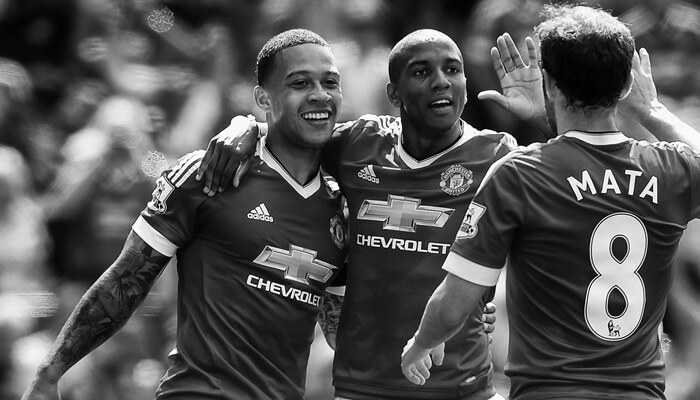 Louis van Gaal has transformed Ashley Young from stuttering winger to a functioning wing-back this season. The 29-year-old has not set the world alight in the new role, but his presence has served a useful purpose amid an ongoing injury crisis at Old Trafford, with new signing Luke Shaw absent for most of the campaign. If nothing else, Young has always been diligent and success in the wing-back position is in part dictated by athleticism; a hard-working winger makes for a good substitute in the role. Another industrious winger, Antonio Valencia, has also been used as a make-shift wing-back this season. Young has taken to the new role with some gusto. There is no denying, however, that his performance has been judged leniently given the player’s previous mediocrity. The Manchester United defence is yet to display any consistent solidity this season. It is easy to mask incompetence in a sea of ineptitude. At United, simply doing the job is never enough. 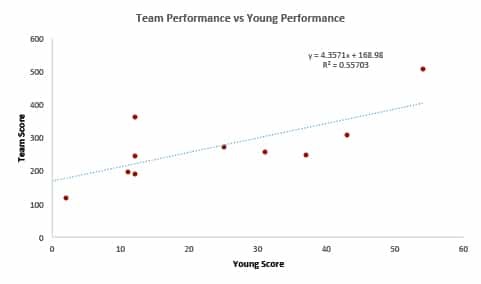 Using Squawka’s index score, which totals a player’s (or team’s) contributions over each game, we investigate the relationship between Young’s performance and United’s overall performance. 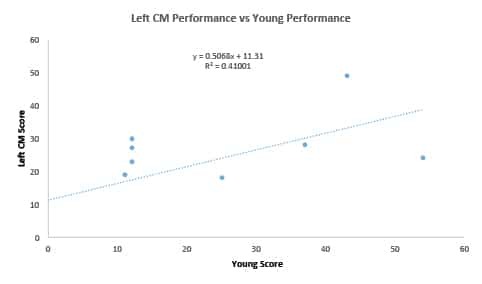 In Figure 1, above, the correlation is strong enough to suggest that Young is making a solid contribution to United’s cause. After all, the Englishman is trusted to marshal the left flank on his own in Van Gaal’s narrow 3-4-1-2 system. Another possible interpretation is that the team is carrying Young; nine other Reds on the field playing well enough to take the heat off the 29-year-old. A make-shift defender naturally lacks inherent defensive qualities and in United’s three-man defence, the left-most centre-back must be dominant enough to allow Young to concentrate on attacking. If the theory is right, Young’s Squawka ratings will be highly correlated with his centre-back partner’s. In Figure 2, above, we discover this is not the case. That is, Young’s good run has not been due to Tyler Blackett or Jonny Evans mopping up after the Englishman. If anything, Young has been exemplary in defence – his numbers, particularly interceptions, dwarf those of a proper left-back in Luke Shaw. What, then, about Young’s midfield partner? In Figure 3, above, the trend is stronger than that between Young and his central defensive partner’s performances. This makes sense – it is the left-sided central midfielder, not the central defender, who is in the immediate vicinity of a left wing-back. Note – United’s game vs. Newcastle was excluded due to distorting effect of Wayne Rooney’s goals on his score in that game. Indeed, Young is heavily dependent on central midfield. If Young is allowing the midfield to prosper then there is no reason why his partner central defender has not prospered too. Curiously, Young’s first two games this season were very poor. Young recorded his third lowest Squawka score against Arsenal. 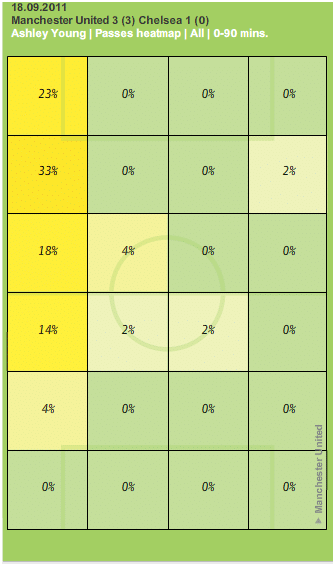 These three games share a commonality in that the left central midfielder was a dedicated holding midfielder. In all other games, his central midfield partner – Angel di Maria, Juan Mata or Rooney – was the more attacking of the central midfield duo. Young’s poor performance in his first two matches at left wing-back may have been caused by acclimatisation to the new role, but United was up and running by the game at the Emirates. So what about the third game of the season against Burnley in which he had the third best game so far? It may be harsh, although not unfair, to describe Young as a mediocre talent. There is two seasons worth of evidence. The former Aston Villa man may have the pace and athleticism, but lacks the technique to navigate the attacking third without relying on speed. As a wing-back, Young has an extra 15 yards to accelerate into. The Englishman has enjoyed plenty of space to gather momentum this season. Young may have a head start as wing-back, but he isn’t the kind of player to beat a man on his own. Playing next to a holding midfielder, the onus is entirely on the former England international to make ground. With a central midfielder such as Di Maria running with the ball and pushing forward, Young faces an easier task. United’s recent game against Tottenham Hotspur is indicative. Young enjoyed his second worst game of the season according to Squawka. Jonny Evans, and later Shaw, had underwhelming games too, but Rooney struggled badly, misplacing 25 per cent of his passes. Young has not somehow reinvented himself as a wing-back, rather Van Gaal’s introduction of a proper box-to-box midfielder – more specifically deploying one near Young – has played to Young’s strengths. There is little doubt that Shaw will walk into the team ahead of Young, fitness permitting, in the games ahead. Young’s deployment should be seen as Van Gaal’s attempt at making the best of what he has rather than a true renaissance – recall that Marcos Rojo has always been picked ahead of Young on the left. 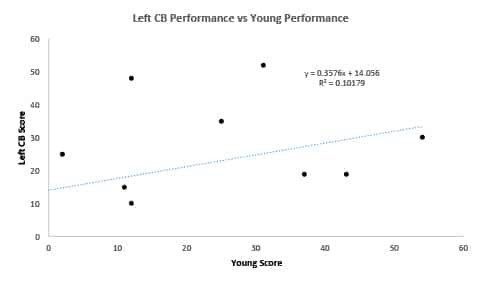 This analysis suggests that Young requires a highly specific system to function. The suspicion is that Young does not have the talent to warrant such treatment. Deploying a ‘wrong-footed’ winger is no longer a radical concept – in fact it is now fully mainstream. Wingers cut inside, vacate space for full-backs to run into, enabling attacking teams to get more bodies into the middle whilst retaining some width. Even lowly Sunderland regularly use inverted wingers these days. More interesting, perhaps, is a corollary now being tested at Old Trafford. Just a little deeper. Ashley Young has deputised for the injured Luke Shaw at left wing-back this season; perhaps it is a simple stop-gap measure, and a natural one at that, considering Young’s typical role as a left winger. Yet, there is also some evidence that Louis van Gaal is entirely comfortable deploying the ‘wrong-footed’ Young at wing-backs. That it is, in fact, part of his grand design. Consider United’s match against Swansea City for a moment, when Adnan Januzaj, a left-footed player, replaced Jesse Lingard at right wing-back. Van Gaal held plenty of alternatives to the Belgian; he could have brought Michael Keane into the centre and shifted Phil Jones to the right, or swapped Young and Januzaj’s flanks. Meanwhile, Nani, a genuine right-winger, was left on the bench. Deploying a left footer at right wing-back seemingly makes little sense. After all, in Van Gaal’s 3-4-1-2 system, wing-backs are the sole providers of width and must be ready to cross; having to cut back eats up precious time, slowing down attacking play. Yet, Van Gaal also asks his midfield two to offer some auxiliary width to make up for the lack of wingers in the system. Should a central midfielder vacate the centre to take the ball down the touchline, midfield could look very bare. In this scenario United’s wing-backs are a natural alternative to provide cover and fill the gap. Wing-backs in 3-4-1-2 formation, for example, are often free to receive the ball and able to cut inside allowing central midfielders space to run into the channels. In this case being wrong-footed helps the wing-back cut in. During early season matches Darren Fletcher has played a loose holding role, with the Scot’s partner is deployed box-to-box. Notice that Ander Herrera partnered the wrong footed Januzaj on the right in the Swansea game and Tom Cleverley was the left central midfielder near Young against Sunderland. Deliberate rather than coincidental, perhaps. Reports that Rafael da Silva has been deemed a surplus are puzzling given that there is a dearth of right full-backs/wing-backs at Old Trafford. The lack of recruitment in this area points to the reports being fallacious. Yet, Van Gaal has a track record of retraining players in a new position. United’s back five come December could – as one example – very well include, Januzaj, and Jones, together with Marcus Rojo and Jonny Evans. Of course, it is easy to read too much into early season developments; the trap of confusing emergency measures with innovation is obvious. Still, the idea of an inverted wing-back cutting into the middle makes much sense. With Juan Mata deployed at number 10, and Wayne Rooney partnering Robin Van Persie up-front, a central midfielder rushing into the box only adds to the traffic, occupying the forwards’ “zone” as the Dutchman one put it. By contrast, diagonal runs from central midfield to the flank take a marker away and create space for the front three. The security provided by an additional centre-back in Van Gaal’s system allows a central defender to act as full-back if required. Tyler Blackett, in particular, has been doing so already. Inverted wing-backs, therefore, allow the front three space, backed by a two man midfield, with a fully functional flank as well. Otherwise there is little to suggest that 3-4-1-2 will be a long-term solution. Herrera is mobile, but lacks the defensive nous to partner Angel di Maria, while Fletcher no longer has the legs. It is hard to see how United will successfully make the transition from defence to attack when the opposition is simply willing to camp behind the ball. At international level Van Gaal used 3-4-1-2 an emergency measure forced by Kevin Strootman’s untimely injury. At Old Trafford it is to accommodate Mata, Rooney and Van Persie in the same team. Shaw’s return, together will Rafael, will offer some genuine width and ease the transition, but it is still hard to foresee how United will break down teams happy to park the bus. United’s lack of wingers mean that lone wing-backs can easily be defended by doubling up. Tempo will be taken out as forwards drop deep to move the ball upfield and United’s opponents will have ample time to organise into a solid unit. Shaw and da Silva are better crossers than Young or Antonio Valencia, but Premier League sides are adept at defending balls delivered into the box. Just ask David Moyes. It is also worth noting that while a draw might well be a ‘half win’ in the World Cup, given the penalty shoot-outs on offer, too many are fatal to top teams’ hopes in the Premier League. The fact that one of Mata or Rooney will have to be deployed wide in a 4-2-3-1 or 4-3-3 adds weight to the theory that an inverted wing-back is a genuine tactical innovation by Van Gaal. Though correct-footed, we may see Rafael or Shaw cutting in at will. Van Gaal certainly has a resumé for tactical revolution. Sir Alex Ferguson, by contrast, was always more of a fast follower than proper innovator. The Dutchman has a Fergusonian ruthless streak though and might very well shoehorn Rooney or Mata into 4-3-3. The thought lingers, however, that United cannot counter-attack its way into the top four. Nor will that extra central defender create or score enough to guarantee Champions League football next season. In the furor that surrounds Ashley Young’s dive against Real Sociedad on Tuesday night there must also come a mea culpa. The confession that Manchester United has benefited from cheating; that other United players have also and will also cheat; an acknowledgement that in different circumstances the outrage might be felt for very different reasons. United might, probably will, lose a game this season as the result of similar dubious tactics and equally malicious intent. It is the game that we play. It doesn’t have to be though. Young was under no obligation to “fold in half” as La Real coach Jagoba Araste so eloquently put it on Tuesday night. Nor did David Moyes have to so publicly back his player either; not after admonishing the former Aston Villa winger for similar theatrics earlier this season. And certainly not after spending much of the last decade as a strong voice in the campaign against diving. Yet, Young goes on. Cheating, seemingly at will, and defying his managers with every turn and fall. It is, after all, far from Young’s first offence – the 28-year-old has been warned not solely by David Moyes, but Sir Alex Ferguson too. And in that Young’s tumble at Anoeta during United’s scoreless draw with Sociedad was barely believable, yet all too familiar in the collective memory. Pundits lined up to add their voice to the general invective over Young’s antics. But none more so that United supporters, whose general sense of disenchantment rang loud. Young is not only an embarrassment, and a fraud, but – and here is the rub – mediocre with it. Herein lies another group confession. After all, Adnan Januzaj was cautioned for simulation earlier this season, while Wayne Rooney and Nani have been known, on more than one occasion, to eat grass with the best of them. Few have found the spotlight quite as intense as United’s Stevenage-born winger. Not from the home crowd at least. Yet, there is something about Young’s manner that grates more than others. It is the shamelessness of it all; the total failure to acknowledge his conceit. The charlatan whose audacity extends to a bare-faced refusal to speak out. An impostor in the famous scarlet shirt. In that Moyes is culpable too. Words really do come so very cheap, not least if Young is selected to face Arsenal this weekend in the most crucial match of the Scot’s short time at Old Trafford. United’s top man was certainly in no mood to lay blame on Tuesday following the Reds’ bore draw in Spain. It does not augur well. In that Moyes brought forth a charge of duplicity – disingenuous outrage against diving in one corner, a blind eye in the other. After all, Moyes once advocated for retrospective punishment and even fined hil Neville for hitting the ground too easily. Not this time – it serves not the man on whose shoulder’s the club’s on-the-pitch ethic resides. “I’m of the view that retrospective viewing of diving should be more important than some of the technology they are talking about bringing in,” said the Scot last season. So too, it must be said, might an internal review of his player’s actions. Young does not have to face Arsenal next Sunday, nor Cardiff City two weeks hence. Nor, for that matter, Bayer Leverkusen in Germany towards the end of the month. There are many supporters not keen on the Englishman’s return at all such is the monotonous regularity with which Young has brought derison to Old Trafford’s doors. It is not as though Moyes is short of options either with Januzaj, Nani, Antonio Valencia, and Danny Welbeck available. Nor has Young conspicuously delivered during more than two years at the club. He probably never will. Although one wonders whether punishment might ever get through – that Young is too callous, or too shortsighted, for the message to fully resonate. Certainly if Ferguson’s rebuke served no lesson, then what might? “Going to ground too willingly was not something I tolerated,” remarks Sir Alex in his recent autobiography. Young also serves as a reminder to those supporters whose stance includes a matter-of-fact assessment. It is, they say, just part of the game. Penalties are won, and lost, depending on a player’s momentary decision to stand or fall. They are, but this is surely a zero sum game. Young’s gain could so easily be United’s fall. Inconspicuous, or decisive, there is little merit in defending the indefensible. It will only come back – kismet’s inevitable last stand. Despite being ultimately responsible for Manchester United’s fortunes David Moyes has been protected by fans to date; the argument being that the new manager has been proffered too little time to impose his own philosophy on the club. Fair enough, although there have been victims during the Scot’s early period at the club, including Ashley Young who is now considered the main culprit of United’s poor start. It has brought into question the winger’s future at the club. The staggering rise of Adnan Januzaj has certainly not helped the former Aston Villa player’s position, although there are few, if any, United players who are playing to their potential. Last season’s 20th league trophy epitomised Sir Alex Ferguson’s reign at Old Trafford – a decent squad went on to better more glamorous sides with little else but determination. In that three senior wingers – Antonio Valencia, Nani and Young – were collectively underwhelming, but England international was the best of the bunch. Young boasted better shot accuracy and had more attempts at scoring than Nani and Valencia. The English winger created more chances per game as well. He also performed solidly in games against big sides when the Ecuadorian failed to impress and the Portuguese was not in the side at all. The fact that Young, who failed to score in 19 Premier League games, recorded better statistics than other senior wingers speaks to the genius of the retired United manager. Young’s début season offered promise. Injuries limited the former Watford player to just 19 Premier League games, but he scored six goals and notched up seven assists. Prior to United’s 6-1 defeat to Manchester City, the Reds often deployed a swashbuckling 4-6-0 system where the front four of Young, Danny Welbeck, Wayne Rooney and Nani roamed at will, with Anderson and Tom Cleverley supporting the front players with almost reckless runs into attacking midfield positions. This season Moyes’ team is playing with more structure. Robin Van Persie and Rooney are deployed as a traditional strike partnership and the central midfield duo does not consistently support the forwards. Dribbling has never been one of Young’s great strengths – last season the English forward attempted one take-on per game, while Valencia tried 2.9 times per fixture. United’s opposition successfully marshals Young down the left flank and forces the right footed forward away from areas where he can use his stronger foot. However, Ferguson often used Young in big matches, where in counterattacking situations, there is more space for Young’s pace and his right foot to shine. The England international suffered twice as many fouls as Nani or Valencia last season – one data points that suggests opponents found Young far more threatening than the latter two. Crucially Rooney’s presence in the middle took some attention away from the former Aston Villa winger. In part Young’s future depends on how Moyes handles Rooney, with the Scouser making it abundantly clear he has no interest in playing in midfield. The English striker’s recent admission that he is “enjoying” playing up front is a clear threat to the new United manager – a demand to which Moyes has acquiesced. With there being no chance of the Scot dropping Rooney to play Shinji Kagawa, Young is unlikely to receive the more central attacking midfield support he needs to be effective. With little hope for a more permanent role, Young’s transfer should be considered, although at 28 the former Villa player would need to be sold sooner than later. The trouble is with Young acquired for more than £17 million, with wages reportedly topping £130,000 per week, there are few that can afford the England international. Let alone a long line of club’s seeking his ‘talents’. Still, if Arsenal can find room for the limited, if speedy, Theo Walcott then there is little reason why United can’t utilise a player of Young’s ilk. After all, Young is a highly versatile player who can play across attacking midfield. Perhaps Sir Alex Ferguson’s comparison of Young and John O’Shea is prophetic after all. Meanwhile, there is little role for Young elsewhere in the team, especially since Kagawa can’t get a game at number 10, the other position at which the England man has been used. It leads to a conclusion – if Young remains at Old Trafford the right flank beckons. Young is a more direct than Valencia and the Englishman’s tendency to quickly cross could aid United in maintaining a high tempo, especially in counter-attacking situations. The former Wigan Athletic player’s tendency to get close to the box is becoming problematic to Moyes’ preferred game. The fact that Young needs to cut in is a great hindrance on the left. On the opposite flank, though, the fact that Young can operate centrally is a burden to bear for the opposition. The Englishman has contributed defensively just as much as the Ecuadorian and a run on the right should be considered. Nani is more technically sound, and a greater attacking threat, but a more defensively responsible player is needed for certain occasions. The burgeoning Januzaj will, of course, limit Young’s opportunities, and in any case, the current system will not bring out the best from the former Aston Villa player. But Moyes is likely to appreciate having a such versatile player in the squad and an experimental deployment on the right is tempting with Nani and Valencia struggling to convince. It’s no so much that the English nation likes a scapegoat – although quite clearly it does – but that there’s fundamental requirement to ignore the deep seated problems in the national game. In the 46 years since England won it’s only international tournament blame has been apportioned liberally after repeated, and frequently embarrassing tournament defeats. This is a cycle long-established, lasting roughly two years; wash, rinse, repeat. Euro 2012 has offered a fall-out so typically English that it ranks right up there with the finest national traditions. Like failing to pass the ball with any sense of authority, or repeatedly using the word ‘bulldog’ before bowing out to a technically superior opponent. England’s national reaction is, of course, one that ignores every fundamental technical, tactical and mental failure inherent in the English game. How could it not, lest the authorities that govern these matters actually resolve to fix the inherent problems in coaching and culture that have contributed to repeated failure. Indeed, the vitriol dished out to Manchester United pair Wayne Rooney and Ashley Young after England’s latest failure is no great surprise; there was always a certain sense of inevitability that the media, and by extension the public, would seek out individuals and ignore the root cause. Little surprise that two players from England’s most successful club should fall victim to the mob either. While United’s striker Danny Welbeck emerged from the tournament with some credit, and Phil Jones is immune having spent three wasted weeks on the bench, it is Rooney and Young that have been singled out after penalty shoot-out defeat to Italy on Sunday night. Young for a series of lacklustre performances, and Rooney for being, well, Rooney. Neither player’s performances genuinely stands out amid a tournament replete with English mediocrity, but, then, scapegoats rarely do. David Beckham, Paul Ince, and Rooney himself, each understands from personal experience the depth of national hate that is so often be meted out to the men in Red. Young’s disappointing tournament was surprising in that the former Aston Villa winger had performed so well for the international team over the past year. Six goals in the player’s previous 10 internationals proffered a player in form, mature and ready to make a genuine mark on an international tournament. Yet, in four games at Euro 2012 Young was unable to deliver the goals, assists, or vibrant performances that had previously flowed so freely. The criticism is in part supported by Young’s stats over the tournament, but then none of a poor English cohort will be proud of their attacking achievements. The United winger completed 76 of 92 passes over the tournament, at 82 per cent accuracy. Young made four shots, although none was on target, created two chances, and provided no assists. There is mitigation, though. After all, at no stage was Young genuinely deployed in the attacking role he is accustomed to at United, nor with the freedom afforded under former England coach Fabio Capello, even in the opening match against France when the United man was nominally deployed ‘in the hole’. Restricted by a system that placed emphasis on defensive shape over possession and attacking fluidity, too often Young found himself running from deep into increasingly lonely dark alleys. That less than 40 per cent of Young’s infrequent touches at the tournament came in the attacking third tells its own story. The 26-year-old was by no means culpable alone for failure in a highly dysfunctional English midfield. Yet, for the all criticism Young has earned, egged on by sabre-rattling BBC pundit Mark Lawrenson, it is Rooney who has garnered most headlines following Sunday’s loss. After all, the hype built pre-tournament by manager Roy Hodgson had reached it’s most fervent pitch by the time of Rooney’s introduction for England’s match against Ukraine last week. The nation expected Rooney to deliver the Pelé-esque performances promised by the team’s manager. After scoring against Ukraine, Rooney was unable to influence England’s match against Italy – a fixture in which the Azzurri enjoyed more than 65 per cent possession; 75 per cent in extra time. It was, of course, always unrealistic to expect Rooney, without a game in more than five weeks, to drag England up from the gutter of defensive entrenchment. But, then, realism and English expectations have rarely been natural bedfellows. Some, though, were very quick to lay the blame on England’s leading striker, including former manager Fabio Capello who claimed, with no hint of irony, that Rooney only performs for United. “After seeing the latest (England) game, I think Rooney only understands Scottish,” Capello said. While Capello’s words smack of bitterness – the Italian having fallen on his sword in defence of John Terry – even the now incumbant Hodgson threw Rooney to the wolves, offering up a headline-writers dream in the process. “I think we put a lot of expectations on Wayne,” Hodgson admitted post defeat to Italy. In truth England’s failure is a collective; of tactical rigidity, technical limitations, and obsessive focus on ‘spirit’, ‘fight’ and ‘work rate’. Across four matches England enjoyed just 40 per cent possession, according to UEFA’s official statistics. Only Ireland and Greece claimed less. Other stats nerds, including OPTA, have the figure even lower. No wonder, when England’s players found a team-mate with just 67 per cent of passes made – the 13th lowest in the tournament. By contrast, there is little surprise that England places top of the ‘tackles made’ table, but achieved the fourth lowest shots on target per game out of the 16 teams at the tournament. This was an England side which sought only to not lose, anything else being a bonus. It was a system built for defensive “heroes” at the expense of attacking talent. “We were being too conservative,” observed now former England defender Rio Ferdinand. “It sends a message to the opponents that you are more interested in defending and playing on the counterattack than making them scared of you. The only time we really kept the ball properly was when Danny Welbeck dropped short to collect it and linked the play. But, usually, he was having to stay up and wasn’t allowed to drop too much because we had set out a certain way with a 4-4-2 which didn’t offer a great deal of flexibility. Not that the critics will concur. It was, after all, Young’s fault. Or maybe Rooney’s. Or maybe a bit of both. But what’s defeat if you have that bulldog spirit? The spirit of yet another English failure. Manchester United heads south this weekend at the start of a testing stretch for Sir Alex Ferguson’s men. The Scot’s side visits Arsenal on Sunday, with a month of potentially decisive fixtures ahead. But Ferguson must again do without without a phalanx of key players at the Emirates as injury continues to bite into the Scot”s resources. Yet, with Tom Cleverley back in light training, Ashley Young slowly on the mend and a handful of other players ready to feature against the Londoners, Ferguson can at least see some light at the end of a long injury tunnel. It will be a huge boon to United’s chances of taking a 20th domestic league title in May. Cleverley moves from the gym to running outdoors this week, with the 22-year-old now out of the cast that has protected an injured ankle since the midfielder hobbled off against Everton in October. The youngster departed just 58 minutes into his return from a similar injury suffered against Bolton Wanders on 10 September. With Cleverley went the vibrant and now seemingly long forgotten flowing football of the late summer. Yet, progress in Cleverley’s rehabilitation means that the England midfielder can realistically look to play some part in United’s Europa League double-header with Ajax in mid February. The midfielder’s return has been a very long time coming, as Ferguson’s side has stuttered through matches with a patched up engine room over the past three months. Indeed, Michael Carrick aside, there has been little consistency in United’s midfield for months. With Anderson and Darren Fletcher also injured, Ferguson has deployed half-a-dozen players in central midfield this season – Wayne Rooney, Phil Jones, Ryan Giggs, Darron Gibson, Park Ji Sung, and even Rafael da Silva. All too often with little effect as the Reds slipped behind Manchester City in the title race, and out of Europe in the group stages. In the meantime, Ferguson’s men will face Arsenal, Chelsea and Liverpool, twice, before Cleverley is ready to start for United again. It is genuinely scary stuff, leaving Ferguson with a big call at the weekend: whether to retain formerly retired veteran Paul Scholes alongside Carrick, risk Anderson’s fitness, or go with Giggs’ experience against the Gooners. Meanwhile, Ferguson’s midfield options will increase further when former Aston Villa winger Ashley Young returns to the side in early February. The 26-year-old, also recovering from an ankle injury, should be ready for selection for United’s Premier League match against Liverpool at Old Trafford. “It’s going well. I’ve been in the gym most days but it’s getting there and hopefully I’ll be back soon,” said Young during a Betfair webcast on Thursday. “I’m enjoying it. From the minute I stepped into the building, I was welcomed with open arms by everybody in the squad. All the staff have been brilliant. There’s competition for places all around the team so you’ve always got to be on your toes. In Young’s absence Antonio Valencia has flourished on the right-wing. Gone are the tentative displays of early season. Back is the dynamic, decisive, attacking Ecuadorian who so impressed fans during his debut season at Old Trafford. Young’s own form has been mixed, much like Ferguson’s side. Following two defeats over Christmas, United can hardly lose any more points now, especially with City at home to Tottenham Hotspur this weekend. That City may well be six points ahead by the time United kick off at the Emirates will only heap pressure on the Reds to grind out a result, at a ground where Arsenal blow distinctly hot and cold. Arsene Wenger’s men have lost two in a row on the road, but still retain, in Robin van Persie, the league’s in-form goalscorer. It won’t get any easier for Ferguson’s men over the next month though. United travel to Liverpool for what is likely to be an intense, potentially draining, FA cup tie in just over a week. Matches against Chelsea, Liverpool – again – and Ajax follow. It is a pity, then, that neither Cleverley, nor Young, will be fully match sharp for a series that will surely decide United’s fate in two domestic and one European competition. In a season of more slings and arrows than Ferguson will care to remember, the Scot can but hope that the duo’s return marks the end of the most serious injury crisis at Old Trafford in the past decade. It is gratifying at least that Ferguson should be able to call on defenders Rio Ferdinand, Chris Smalling, Jonny Evans and Phil Jones at Arsenal. A midfielder or two? Perchance to dream, as somebody might once have said. Ashley Young is a curious character. Not as innately talented as Ryan Giggs or Cristiano Ronaldo, yet the Englishman has managed to establish himself on the left-flank at Manchester United following a £16 million move from Aston Villa in the summer. Plenty of fans were surprised by the move, questioning Young’s value to the club. But it was Young’s flexibility as much as his raw talent that attracted Sir Alex Ferguson. Indeed, when the 26-year-old signed on at Old Trafford, Ferguson compared the former Watford player to a former utility man, now departed for Sunderland. “… John O’Shea, for instance, wasn’t in a starting position all the time but, because of his versatility, he made nearly 400 appearances for us in his career here,” claimed the United manager. Young is similar to the Irishman in that he is an adaptable player who can be deployed in a variety of positions – a real jack of all trades. One must then ask whether the Englishman is a master of anything? One of the English international’s strengths is his athleticism. Young is fast, blazing past markers on the flanks and quickly roaming across the field as a central attacking midfielder. With the player’s great agility and balance, Young makes a formidable opponent. Judging by his frequent forays into defensive positions, the Englishman also possesses great stamina as well. Young is also an excellent deliverer of crosses and set pieces, which has been missing from United’s armory for some time. For that alone, Young must be considered an integral part of United’s first team because there is nobody – bar, perhaps, Ryan Giggs – who can offer good free kicks and corners. But Young is no Rory Delap – the winger is not solely in the side to provide good dead ball delivery. Figure 1. Source: Guardian. Click for larger image. The problem with Young lies in his other assets, which by no means poor, are not exceptional. Consider Young’s passing. While proficient, the midfielder’s passing lacks imagination and creativity. Perhaps Young is simply still acclimatising but too often his passes, especially those of a more adventurous nature, have been weighted and executed poorly. For this reason alone Young should only be considered for the attacking midfield/second striker role as the last resort – especially when Wayne Rooney, Giggs, and even Anderson can play the role. Another concern is Young’s movement. 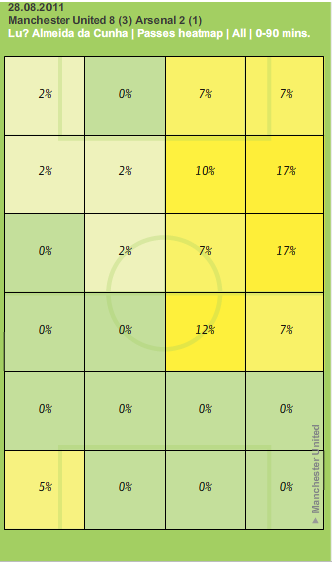 As an “inverted” winger, Young should look to cut in more, allowing Patrice Evra to overlap. Figure 1, left, demonstrates that Young has remained predominantly on the flank, hitting the byline and getting chalk on his heels one. Comparing Young’s movement to Luis Nani, Figure 2 below, demonstrates just how glued to the touchline Young really is. As a right footer, Young needs to check back before crossing. While these inswinging crosses can be extremely dangerous they are harder to pull off once the winger approaches the byline. In addition, given that Young can shoot from distance, it is curious why he doesn’t exercise that option more frequently by drifting infield. Perhaps the reason is Young’s dribbling, which is not at Nani’s level. Young prefers to beat a man with blistering pace and not clever trickery on the floor. Given this predisposition, Young’s obsession with hitting the byline makes sense as he need only beat the full-back with pace. It is not so easy to cut in to the middle where there are midfielders and central defenders to worry about. Figure 2. Source: Guardian. Click for a larger image. If it wasn’t for Ferguson’s other options Young would probably be better deployed as a classic wide man on the right. One disturbing thing about all of this is the fact that Young is ill-suited to modern formations such as 4-3-3 and 4-2-3-1. In 4-4-2, Young has a bit of space to accelerate before facing the full-back. In 4-3-3 or 4-2-3-1, as a winger, Young directly faces his marker and no space to gain momentum. Young’s limitation, in essence, boils down to one issue – predictability. There is no doubting that Young is a good player but, to truly cement his place in United’s first team, he must learn to play with a more flair. Against the very best sides, such as Barcelona, Young will be more easily countered, just as he has been against Chelsea and Liverpool in recent matches. He must rely less on pace and develop his game to yet another level. 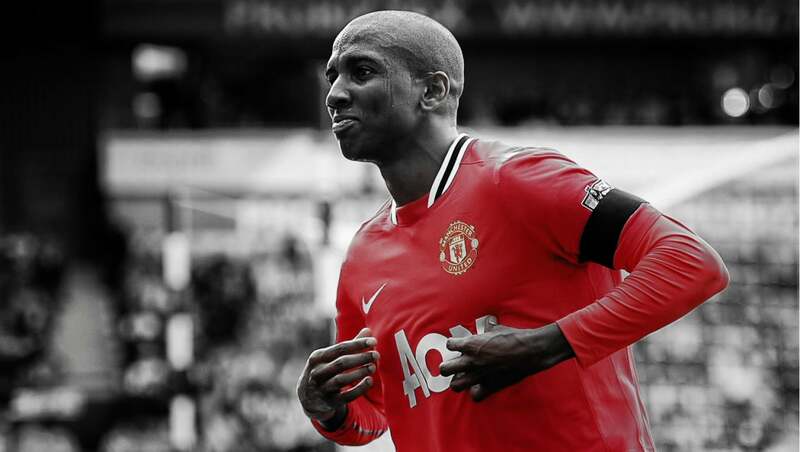 Poll: Will Ashley Young be a success at United? England international Ashley Young completed the formalities on a £15 million transfer last week, adding to Sir Alex Ferguson’s options in attack. The transfer caps a memorable year for 25-year-old former Watford player, who has broken into Fabio Capello’s England team after missing out on selection for the 2010 World Cup squad. However, despite the player’s progress with Aston Villa over the past 12 months not all Manchester United supporters are happy with the acquisition, questioning Young’s quality. Moreover, with Nani and Antonio Valencia both preferring United’s right flank, Young will likely be used on the left – a position that Capello does not believe brings out the best in the new recruit. So, will the £15 million man be a success at Old Trafford or do the critics have it right? Young deal close so what now for Nani? Ashley Young successfully completed at medical at Bridgewater Hospital today ahead of the Aston Villa winger’s £15 million transfer to Old Trafford. The test, just three miles East of United’s home turf, was the latest formality in a much-anticipated move by the England international. It will likely be officially confirmed when the transfer window opens on 1 July but there is now little doubt that the 25-year-old will join Sir Alex Ferguson’s roster for next season. But with Antonio Valencia now Ferguson’s preferred choice on the right flank there is an increasing feeling that Portuguese winger Nani’s four-year spell in Manchester has now come to an end. It is an exchange in personnel that does not obviously upgrade United’s squad. Young, who joined Villa for £9.75 million from Watford in 2007, will more than double is wages to £120,000 per week at Old Trafford after choosing the Premier League champions ahead of a move to Liverpool this summer. Much as Blackburn Rovers defender Phil Jones had earlier this month. The transfer marks the zenith of rapid progress over the past year for Stevenage-born Young, who has also forced his way in Fabio Capello’s England, scoring against Denmark and Switzerland this season. No longer a youngster perhaps, but Young’s progress towards Old Trafford was not born of an auspicious start. Initially rejected by Watford as a teenager, the player eventually broke in Ray Lewington’s side during the 2003/4 season, making five appearances from the bench. But it wasn’t until 2005/6 that Young achieved a real breakthrough in professional football, with more than 40 appearances for the Hornets, scoring 14 times and creating 13 in the Championship. An excellent start the following season in the Premier League increased interest in the player, drawing a £10 million bid from West Ham United during the January transfer window. Young rejected the move before forcing through a transfer to Villa; a sign of the determination to play at a higher level that would be repeated this season. “I’ve always said that I’m an ambitious person. To play in the biggest competitions, the European Championships, the Champions League, FA Cup finals, League Cup finals, the World Cup, the Euros,” said Young earlier this season, signalling his Villa departure. Young’s improvement are born out in his statistics, which are a touch better than average this season, having scored nine and assisted 15 in a poor Villa side. It’s around par for the course for a player who has achieved a greater level of consistency at Villa Park in a variety of positions. By contrast United’s Nani scored 13 and created 17 in all competitions this season and that comes after the Portuguese lost his place to Valencia in the final weeks of the campaign. Yet, for all Young’s progress over the past four years with Villa there is an inherent feeling that the player has already reached his peak. Certainly, if players coming to Old Trafford fit two camps – those who will improve United’s first XI, and those whom fans hope will improve to the level of United’s XI – then Young is firmly in the latter. Certainly few fans will buy the argument that Young enhances United’s first team; nor will Europe’s finest be overly concerned at Ferguson’s new addition. Then there is the question of Young’s place in the United side. After all the player has excelled as a deep-lying striker with Villa over the past year; the position in which Wayne Rooney showed such outstanding form towards the back-end of last season. It points to a place on United’s flank. Unless Ferguson plans to drop Javier Hernández and deploy Rooney as United’s ‘number nine’ once again, then Young will surely compete for a place on Ferguson’s left-wing. What then of Nani, who seems certain to head to Spain or Italy this summer. Indeed, despite Young’s acquisition it is United’s failed pursuit of Udinese’s Alexis Sánchez – a player the club has watched for three years without making a bid – that offers the clearest indication Nani will end four years at Old Trafford. After all, rumours of the Portuguese’s dissatisfaction with a contract that has two years to run have become more than a whisper in recent weeks. That United has done little to quell the speculation about the club’s Player of the Year says much. In that scenario the question becomes whether swapping Young for Nani has improved or degraded Ferguson’s team. Of course, supporters posed the same rhetorical question of Valencia before the Ecuadorian’s £14 million move from Wigan Athletic two years ago. Valencia, who is only six months younger than the Villa forward, has been a huge hit at Old Trafford despite Cristiano Ronaldo’s shadow. Young will certainly join the Ecuadorian Manchester; time will tell whether he is also a success. Young deal on the cards; will he fit? It’s not often that Rant comments on transfer speculation, after all there are plenty of red tops chasing paper sales that suit the practice better. More to the point, there has been so little activity of note in recent seasons that speculation is, by definition, an exercise in futility. However, recent tabloid commentary about Aston Villa’s 25-year-old winger-come-forward Ashley Young not only has merit but might point to a deal that brings quality to Old Trafford at a price Sir Alex Ferguson considers ‘value’. Such is the recent heightened speculation about Young that former Tottenham Hotspur midfielder Jamie Redknapp assumes a transfer North is a done-deal. After all, his father, Spurs boss Harry, knows a thing or two about doing a deal and will have sounded-out the player, whose Villa deal expires in 2012. Indeed, there is more than a whiff of Antonio Valencia’s transfer to United in summer 2009; a deal which United had effectively completed six months previously. “Ashley Young looks better every time I see him, he has electric pace and dribbles with his head up; he looks a future Manchester United player to me, and an ideal replacement for Ryan Giggs,” said Redknapp today. No Ryan Giggs of course, but Young’s star is on the rise; a talent that has progressed in each season since the player made his Premier League début with Watford in 2006. Moreover, United is a left-winger short though, with Giggs in his 38th year and Park Ji-Sung injury-prone and normally earmarked for a specific defensive job in the Champions League. In fact Sir Alex Ferguson is heavily reliant on the pair, whom have played 51 times between them to date this season. Giggs has signed a new one-year deal with the club, keeping the Welsh legend at Old Trafford for one final hurrah, although Park is yet to extend a contract that runs out in 2012. The South Korean’s form this season is patchy enough to question his long-term future in Manchester. Meanwhile, Young has progressed under Gerard Houllier even if his Villa team has gone decidedly backwards. Used as an orthodox winger by previous coach Martin O’Neil, Frenchman Houllier has discovered a greater flexibility in the player, with Young frequently deployed right or left in a forward three or ‘in the hole’ behind a target man this season. In fact, just the kind of adaptable forward Ferguson treasures. Young’s statistics are a touch better than average this season, having scored eight and assisted 13 in a poor Villa side. It’s somewhat lower than the 17 assists credited to the former Watford player in 2007-08, although the player has half-a-dozen games to correct the statistics. By contrast, United’s Nani has 10 goals and 16 assists in all competitions this season. The player would welcome a move to United of course, with Villa in free-fall this season and unlikely to qualify for European competition. Having broken into the England side since the World Cup, Young is unlikely to countenance another season in mid-table ahead of Euro 2012 in Poland and Ukraine. “It’s always nice to be linked to those sort of teams [Spurs, United, Liverpool] but I’m an Aston Villa player, I’ve got a year left of my contract. I just want to do well for the club,” said Young this week, in the usual heavily media-trained guff that footballers normally emit before signing elsewhere at the first available opportunity. The question for United is twofold: is Young good enough for the club and is the deal at the right price? Certainly, Young’s price-tag is likely to be the Glazer family’s liking given the players contract situation. If Gareth Barry’s transfer to Manchester City for around £12 million in 2009 is a benchmark then United may just be close to sealing a bargain for a player whose star is on the rise. Yet, United supporters will rightly ask questions of Young’s pedigree. After all, the 25-year-old is no top performer in the Champions League, nor is he an 18-year-old with a world of progress ahead. On the cusp of United’s upper age-bracket for transfers, Young can add only to the Reds’ squad resources rather than take Ferguson’s team significantly forward. Supporters asked the same questions of Valencia though, before the Ecuadorian’s £14 million move from Wigan Athletic. 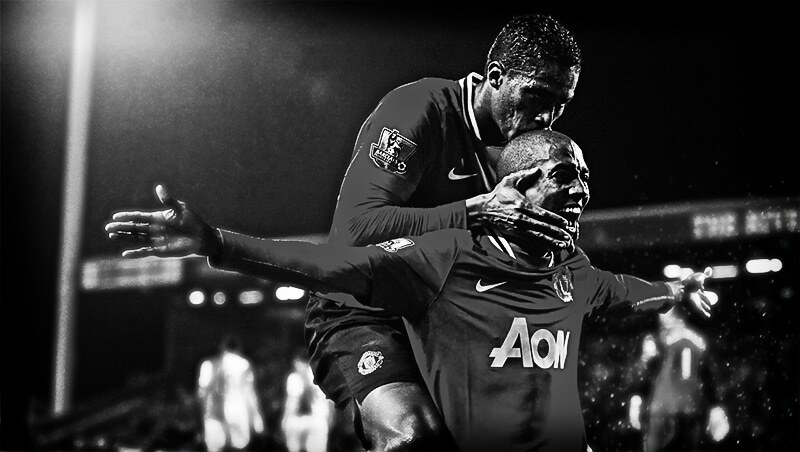 And Valencia, who is only six months younger than the Villa forward, has been a huge hit at Old Trafford. Time will tell whether Young will join the Ecuadorian; in Manchester and success. While Rant rarely engages in idle gossip, newspaper reports have once again linked United with a £20 million move for Real Madrid outcast Klass-Jan Huntelaar. It’s not the first time that the club has apparently expressed an interest in the former Ajax player, who scored eight goals in 20 games for for the Spanish club last season. Manager Sir Alex Ferguson had reportedly been tracking the striker before his £19 million move to Madrid in January. However, the arrival at Real of Cristiano Ronaldo, Kaká and Karim Benzema this summer means that Huntelaar will be available for transfer, just six months after moving to Spain. The forward, who has scored 13 goals in 23 appearances for the Dutch national team, has become a victim of President Florentino Perez’ bank-loan inspired revolution at Real. The question is, do United really need another central striker? That is not to doubt Huntelaar’s quality as a goalscorer, who’s record at international and club level is better than a goal every other game. But with Wayne Rooney, Dimitar Berbatov and Michael Owen now at the club, there would seem to be little room for another forward. Indeed, there was really little point bringing Owen into the squad if Ferguson is also after Huntelaar as both occupy the same role. This argument is even more pertinent when youngsters Danny Welbeck and Federico Macheda are brought into the equation. At the same time, the club has also been linked with a £25 million move for Aston Villa’s excellent winger Ashley Young. The former Watford wide-man has progressed immensely in the past two seasons to become a regular in Fabio Capello’s England team. However, for a player who is unproven at international or Champions League level, Young would cost a fortune. Primarily because United would be shopping at one of the league’s leading teams, but also because there’s always a premium on English talent. But United are weak in wide areas, despite having Ryan Giggs, Nani, Zoran Tošić, Ji-Sung Park, and new signings Antonio Valencia and Gabriel Obertan in the squad. Serbian wonderkid Adem Ljajić is also due to join the club in January 2010. But Giggs aside none are proven at the highest level, and unfortunately the legendary Welshman is in the twilight of his career. Together with Valencia, Young would add extreme pace in wide areas – something United will lack through the middle of the park next season. While Tošić, Ljajić and Obertan may well prove themselves in the long term, nothing is guaranteed. Park, meanwhile, deserves his place in the squad as a willing worker but is never going to win a game on his own. Nani is in the last chance saloon. Young, although frighteningly expensive, will be available if he expresses his desire to leave and does have the requisite quality to make a real difference at the top level. He would surely be a better use of more than £20 million.